Skip the worry of finding an airport taxi to take you from Phoenix Airport (PHX) to your Phoenix-area hotel by pre-booking this reliable and economical shared transfer service. Transfers are available to accommodations in Phoenix, Scottsdale, Tempe and Mesa, operated by a professional driver who meets you at the airport and takes you to your hotel in comfort and ease. 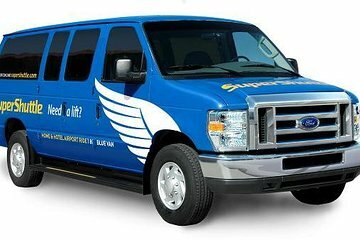 Start your vacation or business trip to Phoenix with reliable door-to-door shared transfer service. No need to worry about finding a taxi with this convenient transfer option. A comfortable climate-controlled vehicle operated by a professional driver takes you from the Phoenix Airport (PHX) to your hotel in Phoenix, Scottsdale, Tempe or Mesa. After meeting your driver outside the arrivals area, settle into comfortable seats with generous legroom and luggage space to travel from the airport to your hotel. When booking, please provide your flight arrival details as well as your hotel information. Your shared transfer will be confirmed when you are booking and you will receive a travel voucher to present to the driver. Remember to book your shared return transfer too! Great service at the airport and not a long wait. Very nice and friendly driver helped too. What a fiasco!! The Super Shuttle employee, Cedric, at the airport did his job as expected. However, that was the highlight of the trip. When our driver in Van 958 arrived and found out that not only were we going to Scottsdale but that we had also prepaid for the ride, he took a curmudgeonly attitude and implied that Supershuttle didn't go to Scottsdale and even if they did he said the chief dispatcher told him that he had a van full traveling as a group to a Phoenix location and we'd have to find another ride to Scottsdale and then drove off.. I raised this issue with Cedric who assured me Supershuttle went to Scottsdale and he wondered why he wasn't alerted about the new assignment for the driver of van 958 and that he would get us a ride ASAP. Ironically that new ride was the same driver Although I was unwilling to tip the driver for his initial antics, my wife thought otherwise and when she tipped him he brusquely said, That's 38, ma'am. When I responded by saying this was a prepaid trip, he curmudgeonly called the head office which confirmed my position and then drove off in a huff. This was a great transport from the airport, only thing I would mention is it wasn't easy to spot WHERE to meet up right at first. excellent service. Pick up right on time, and friendly driver was courteous and got us to your hotel safely and efficiently. we did not have to wait long for the shuttle. The ground person was helpful and gave us cold water. Booking was straightforward on-line, shuttle service was excellent and everyone was helpful and friendly, and price was by far lowest at Phoenix airport.I would recommend your services to ANYONE! Thank you Viator! !